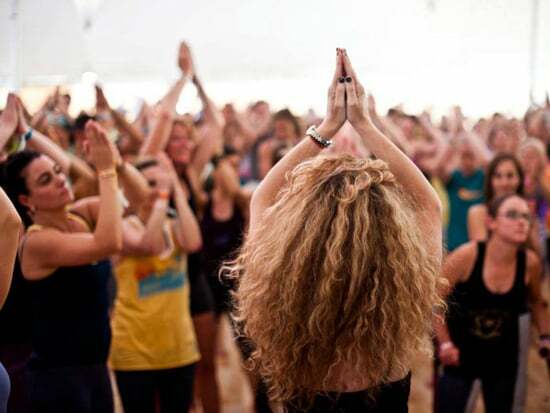 Seane Corn is an internationally celebrated yoga teacher and impassioned global activist. 1440: Transformation. Consciousness. These are hefty concepts we hear about in yoga. How does yoga ignite transformation or elevate consciousness? What does that look like? Seane Corn: Transformation is magic. Magic is defined as shifting energy at will. It’s the alchemy of transforming the lead of our fear into the gold of our wisdom or understanding. For me, that requires movement and breath and shifting the caustic energy that lives within our bodies because of trauma, life experience, karma, what have you. In an asana practice, you move that energy and the movement creates spaciousness. Underneath contraction, there is expansion. Underneath shadow, there is light. The light is always within us, and the expansion is already within us. But the experience of living clouds it over with tension—emotional, psychological, and physiological tension. Yoga releases tension and allows us to feel our emotions. It allows us to connect to our vulnerability. You connect to your vulnerability, it opens you to surrender. You can’t access surrender through your head. It can only be felt through your heart. It’s experiential. When we open ourselves to that light, that spirit within, that love, if you will—that is consciousness, that is transcendence, that is the shift of energy, the magic that opens us to our highest essence. When we open to that highest essence, we experience it everywhere. It’s in the trees. It’s in the birds. It’s in other beings. It’s in all aspects of this experience of being human, of being alive. 1440: You are teaching a program at 1440 this September called Spirit Speak Teacher Training. Can you talk more about this idea of inviting spirit to speak? Seane Corn: The questions I get asked most often about my teaching are: How do you bring God into a classroom? How do you create a sacred experience? How do you deal with the different spiritual beliefs that might be in the room? People also tell me they feel a deep magic in their hearts, but they’re so afraid to speak it for fear of being judged or rejected, and they’re not willing to take that risk. And so, I’ve really thought a lot about how best I can support people to make spirit feel more accessible. It has a lot to do with self-confidence. But, when I say self-confidence I mean self-confidence with a capital S. I mean the confidence I feel about my highest Self in relationship to God. If I tap into that highest Self, the words are already within me. All I have to do is open my mouth and trust and not second guess what’s coming through me. That doesn’t mean teaching yoga doesn’t require skill and practice. Like anything, it does. It also requires being willing to completely mess up. Spirit Speak provides some of the tools I use to structure a class, and it uncovers talents that are already inherent within us, and it looks at what gets in the way of their expression. As a group, we explore how to utilize all the many tools within ourselves to help actualize the experience of yoga so that it’s more of a journey of the soul rather than just a class for the body. 1440: It’s clear that your practice is anchored in devotion to the sacred. What is most sacred to you? How do you define God? Seane Corn: God is truth and love. What is most sacred to me is being in a relationship to that truth and love in all that I do and say and create every day. Not to suggest that I do, because I have an ego, and I’m in human form like everyone. But my goal is to really live that yoga, to be that yoga in every aspect of my life. My relationship to spirit is my priority, and that has to show up in my relationships, and it most certainly has to show up on the yoga mat. And so, when I practice yoga, and I put my palms together and pray before I even take the first asana, I dedicate every movement and every breath to God. And then I set my intention for the practice—not just to benefit my own wellness, but to send energy out in a positive and mindful way to an individual or a global circumstance. By making my practice a conscious action, a ritual, by making it intentional, it connects me to the sacred. Although I get the benefits of the practice—physically, psychologically, emotionally—there’s something else that’s going on that connects me to the collective. It’s not something I taught right away because I didn’t know how to describe it. It’s so personal. It’s so subjective. But eventually I realized that without it, I wasn’t fully sharing my yoga. I was sharing my asana, but I wasn’t taking risks and I wasn’t allowing for an intimacy to occur within the room. How could I ask other people to feel and to be vulnerable and to be open when I myself was refusing to be fully vulnerable and open? So, I began to bring my prayers into the room. That prayer is me saying out loud what it is that I need to hear, but I’m using language that makes it general and relatable to everyone. That is how spirit resides in my personal practice, and it’s what I hope can make the yoga experience for my students not just about the body, but can move us to the soul. Seane Corn will be teaching Spirit Speak Teacher Training at 1440 Multiversity from September 23 — 28, 2018. Even after yoga teachers master the mechanics of practice, so many new teachers are left yearning for a way to guide their students to a place of deep surrender, prayer, and intentional energetic shifts. Holding space for transformation starts with a commitment to our own inner journey, plus the compassion, courage, and willingness to share that experience with others. This article was originally posted by our partners at 1440 Multiversity. Images via 1440 and PopSugar.